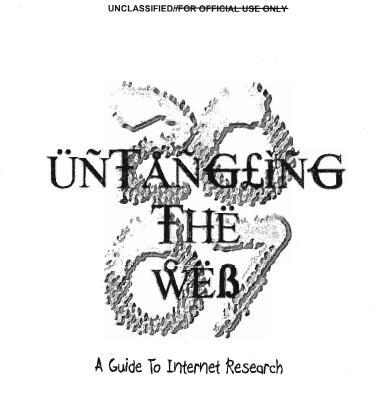 Untangling the Web was released as a result of a Freedom of Information Act request by the open government group Muckrock. You can download your own copy of this 600+ page PDF directly from the NSA. This entry was posted on Friday, May 10th, 2013 at 12:01 am	and is filed under documentation. You can follow any responses to this entry through the RSS 2.0 feed. You can skip to the end and leave a response. Pinging is currently not allowed. Nice try NSA. Do you *really* think I’m going to download and open your PDF??? I did. Didn’t crash my viewer or anything. Also, it’s a really good read. If you are concerned, use a library computer. Looks like it was just was released May 15,2013 on Amazon at a cost of $29.99.